﻿These are photos from this year’s cider making. We are fortunate to have a garden which allows us to wash, prepare and mash the apples. Our vigo press is the tool that lets us press the mashed apples and the pressed juice flows directly into our sterilised demijon containers. 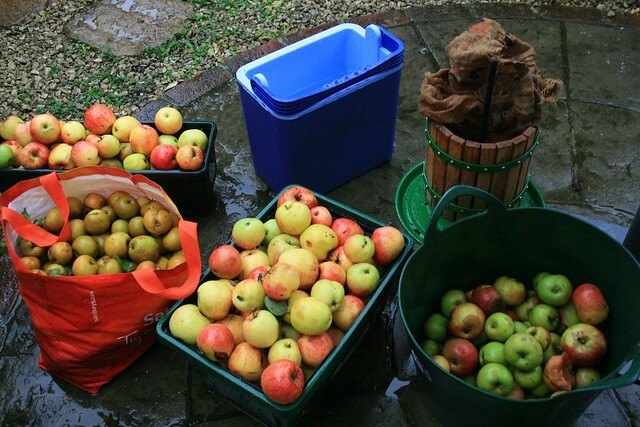 We made 7 gallons from this collection of Gala, Bramley, Golden Delicious, Cox’s and Russet’s – all from the local Sussex countryside. We have two apple trees in our back garden – a Golden Delicious and Fiesta. The Bramley is a cooking apple, with Russet, Gala and Golden all being rich, crisp dessert apples. We are going to be racking off the cider in the next couple of weeks into spare demijons to allow a secondary fermentation to increase the final strength (ABV) of the cider.